Automatic strainers are used in basic solids removal and act like a colander to capture solids while allowing water to flow through the system. These strainers use a series of different sized screens to trap the largest to smallest solids and are very effective as a pre-filtration or purification system. 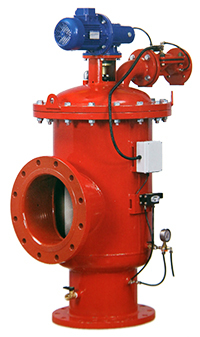 All Water Systems offers a comprehensive line of automatic strainers in capacities to meet a wide range of applications and industrial requirements. Fully automatic, semi-automatic, and manual operation is available. Enhanced water conservation through minimum water use during cleaning. Vessels constructed of plastic, carbon steel, and stainless steel. Electronically monitored cleaning cycle with flexible control options. Units from 2" to 14" pipe size. Modular design available for high flow rates. These automatic strainer systems can operate as stand-alone units or be integrated into complete water treatment packages. We also offer options and accessories to complement our automatic strainers including water meters, pressure gauges, contact tanks, storage tanks, pumps, chemical feed pumps, control equipment, and monitors. For more information about our automatic strainers, call us at (412) 824-6560, or click here to contact us.